Ill at Will (IAW) is a Canadian street dance crew established in the summer of 2008. Based out of London, Ontario, our aim is to educate today’s youth on the positive aspects of hip hop culture while creating a unique entertainment value to the public. We provide dynamic entertainment solutions for weddings, brand promotions, birthday parties, and more. 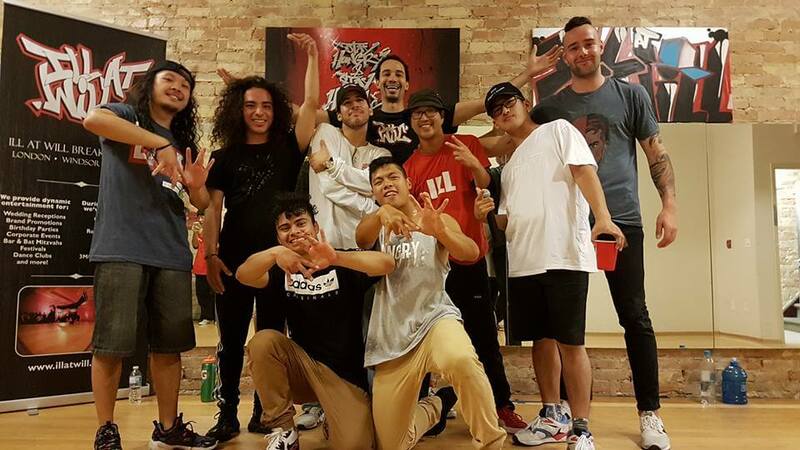 Members of IAW are actively involved in the community of London, Windsor and Toronto organizing dance workshops, competitions and open practice sessions. Additionally, we like to travel to exchange knowledge and continue building the foundation for the London dance community at competitions throughout Ontario, Michigan, and New York. In the summer of 2017 we performed at Rock The Park – I Love the 90s Tour alongside Naughty by Nature, Vanilla Ice, Salt N Peppa, Rob Base, and Young MC. Our performance highlights over the past decade include Adidas/Bacardi Fashion Show, Royal Bank, Canada’s Walk of Fame, a feature on Sports Lab episode on TVO Kids, London Dance Festival and United Way of London & Middlesex. Reserve IAW crew for an exciting breakdance performance by clicking here! Find out more about us by checking out our recent performance at Culture Days London, below.